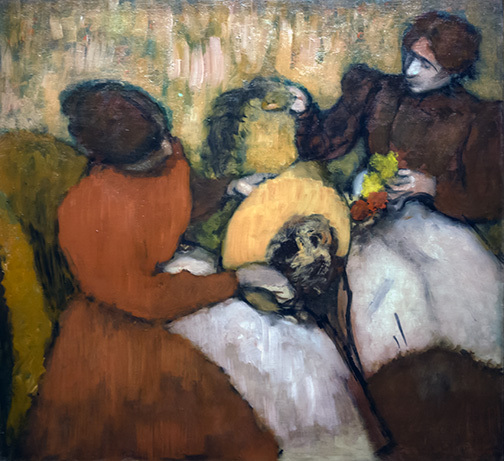 For lovers of the French Impressionist painters and those interested in French, fashion, and women’s history, there is just one more week to see the extraordinary exhibition, Degas, Impressionism, and the Paris Millinery Trade, at San Francisco’s Legion of Honor Museum. The exhibition can be enjoyed for the exciting collection of paintings by Degas, Renoir, Morisot and others and also for the rich context of the paintings. Edgar Degas, The Millinery Shop, 1879-1886, Art Institute of Chicago. In late 19th century into the years just before World War I, a hat was a necessary part of one’s clothing. It clearly described one’s place in society. The more embellished with ribbons, plumes, and in some cases whole birds, the more one could be regarded as part of the idle rich. A straw boater was a necessity for men and women even if one never owned a boat. At the same time, a woman wearing a straw hat might also be a woman who wore bloomers and rode a bicycle. The craze for elaborate hats gave the millinery industry a huge economic boost at exactly the same time that the invention of the department store allowed middle class shoppers access to a vast variety of purchases. The independent millinery shops existed side by side with the department stores’ mass produced products and became more exclusive, catering to the desires of wealthier women competing for the finest, most up to date hats. 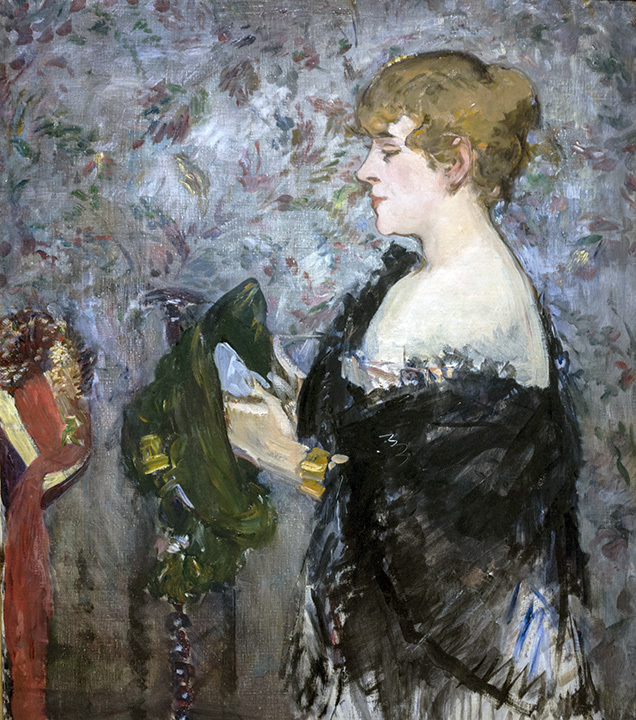 Edouard Manet, At the Milliner’s, 1881, Fine Arts Museums of San Francisco. Although their customers might be very wealthy, the women who worked at a milliner’s shop were not. The head of the shop, called the premiere, could make a fair living, but she needed an array of workers who were skilled with a needle, knew about felting, and were desperate enough to work exceedingly long hours for next to nothing in pay. The hours could extend around the clock at the height of a “season.” Millinery workers were exposed to the dangers of mercury used in the felting process and arsenic used in taxidermy to keep from decay the birds or small animals on the hats. Twelve or fifteen hours of breathing such elements in an attic room without ventilation could cut short a milliner’s career if not also her life. This was a good setting for the spread of tuberculosis. The reputations of millinery workers were compromised by the idea of female workers as prostitutes. Income was slight; additional resources might be accepted and surely were offered. The milliners often wore samples of their creations or were seen working in the shops either making the hats or selling them. For the middle or upper class shopper-onlooker, the woman was a commodity much like the hat. Manet’s painting above with a woman whose shoulder is bare may represent a customer trying on hats or a milliner revealing more about herself. The Impressionists took a strong interest in the changing society around them and found inspiration in the emerging middle classes, contemporary sporting pastimes, and real occupations. All of this is examined in the paintings in this exhibition. 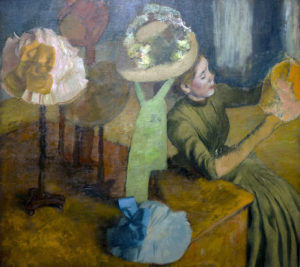 Additionally, one may look at the pictures of the millinery shops and see, for example, Degas’ focus on color and design. The hats can be seen as pools of color making an all over design and the women working with the hat part of the design themselves just as they are both creators and tools of the millinery industry. The exhibition includes a fascinating array of hats of the era. Don’t miss a chance to see them: the hats have stories to tell. Not least of the stories is how at least 300 million birds were killed for their plumage in the year 1911 alone. Perhaps only the Great War, which changed fashion to less extravagant styles, slowed the massacres by imposing massacres of its own. This entry was posted in Hedgehog Highlights and tagged Berthe Morisot, Edgar Degas, Edouard Manet, Fine Arts Museums of San Francisco, French fashion, Impressionism, Legion of Honor Museum, millinery, plumage, women's employment on September 18, 2017 by Leslie.